It’s calving season at Twodot Land and Livestock, one of the partner ranches of Yellowstone Grassfed Beef. This ranch practices holistic management, which means they do things a little differently than many beef producers. One difference is that they calve in June rather than in February. This is the same time that the elk, deer and antelope are having their babies. The mother cows have high nutrient, green forage available to turn into nourishing milk for their calves. This also reduces the labor and expense of feeding hay. Being born in warm weather reduces stress and sickness due to winter storms. It is also a time when predators have plenty of other food sources, so fewer are lost to predation. The calves are not sold at the October market as those February calves are, and instead are sold as two year old grass finished animals to the private market – restaurants and grocery stores across the state like ourselves. This creates an alternative economy that supports the ranchers’s holistic practices and provides us with delicious and nutritious grassfed beef straight from the source. We use Yellowstone Grassfed Beef in our Hot Pastrami Sandwich, pictured below. 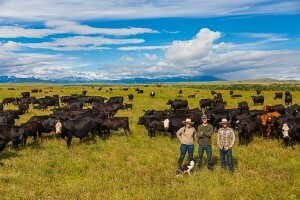 Learn more about Yellowstone Grassfed Beef on their website. 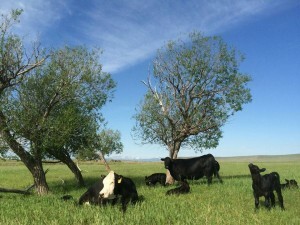 Photos of cattle courtesy of Yellowstone Grassfed Beef. 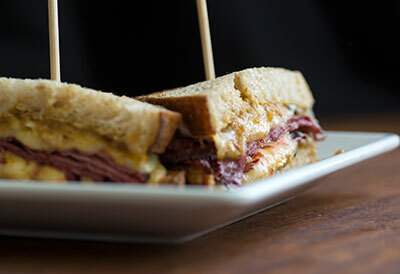 Photo of pastrami sandwich courtesy of Janie Osborne Photography.